Faith doesn’t necessarily have to relate to religion, it could also mean trusting or having confidence in something or someone completely. It acts as a guiding path, it motivates humans to complete certain acts and keep improving. In Natural science, many things are based ion faith; for example when scientists make hypothesis all they’re doing is creating statements without any proof of their success or if they are accurate. Faith offers a structure in our lives and even though it may not seem like a very important aspect, most people need something to believe in. For most religions, there is almost no evidence to support their beliefs but still, people believe in them because they agree with their morals, or because they actually believe there is someone out there who can always help them and that brings hope into their lives. Faith also establishes our ethics and morals which helps us to understand ourselves better and determine the choices we make. Faith does not need any justification or proof. Those who hold the faith may see the belief as self-evident, while others may not. Therefore, it is not convincing for everyone, people will start questioning if what they believe in is actually true or not. For example, in religion, Jihadis, when they receive their training, are implanted with the misleading faith that God will promise them paradise as a reward for acts of martyrdom. It lacks certainty as some people might disagree with the way they act. “The vagueness and ambiguity of language always limits the production of knowledge”. Humans have been using language to express our thoughts, connect with others and also share our knowledge since the beginning of time. The combination of sound that is used to communicate with people forms one of the fundamental parts of the community. In some ways, language allows us to facilitate our thoughts and help us to develop them well. Without language, our thoughts would make no sense as thinking also requires a natural mental language. Therefore much of our knowledge acquisition is mostly based on our language. However, there are times when language becomes vague and ambiguous and limits our production of knowledge, people have hard times associating things together to show patterns which explain how the world works. For example in Natural Science,(chemistry) there are specific terms for different compounds. There are organic compounds which look similar to a structure drawing but have vastly different properties. One example of disastrously different effects of very similar molecules is thalidomide. There are two isomers, only differing in their stereochemistry. The (R)-isomer is responsible for the sedating effect it was initially used for. The (S)-isomer lead to horrifying birth defects in the children of woman that took that drug. A slight error when describing the structure of compounds due to the vagueness of language might limit our understanding of the compounds. Another aspect that can be considered is the Arts. Arts, similar to language is also a very effective way of conveying concepts and emotions in a way that others can understand and recognise. Metaphors are often used in commercials nowadays. However, a lot of the commercials are targeted towards a specific type of people. The Macdonald advertisement showed below are targetted towards Muslims. 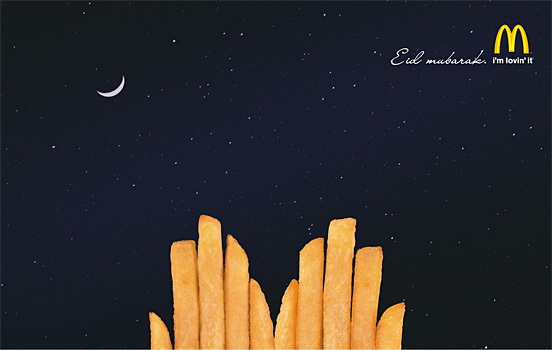 Muslims may see something in this text that non-Muslims may miss, the french fries which represent the fingers of hands that are praying. NOn-muslims might not be able to understand the culture of the metaphor and therefore the message they receive will be limited. Despite the imperfections of imagination and memory as ways of knowing, the Areas of Knowledge have developed in such as way as to overcome them. Discuss this claim with reference to at least two AOKs. Both imagination and memory as a way of knowing are imperfect. Imagination can mislead people on how they interpret situations as fantasy might lead us to imagine things that are impossible for logic to prove. Our memory can be unreliable at times as people have the tendency to fill in gaps of missing information with what they believe is true so that a logical chain is made. Research shows that what we feel when experiencing an event, has more to do with remembering it, even if it was insignificant or worth remembering. Sometimes we may not realize it, but every day we are forming new memories with imaginations, discarding old ones and recollecting those that we thought we’d never see so clearly in our mind’s eye. To overcome the challenges in history, people started to record history in different forms. Before words were invented, human used oral tradition which is the passing of history through verbal communication as a way of preserving memory. The problem with oral tradition is that it might be biased. This is possible because of nature of transmission itself. Oral transmission is full of imagination, exaggeration, creativity. Oral tradition does not go very far in the past. The transmission of information depends on the power of memories of successive generations. Therefore human started to record history in written form. The span of recorded history is roughly 5,000 years, beginning with Sumerian Cuneiform script, the oldest discovered form of coherent writing from the protoliterate period around the 30th century BC. Through the documents of the written communication top executive can present the information more accurately and clearly. Also, in this communication system information is recorded permanently. So, there is less possibility of distortion and alteration of the information. Natural Science is another area of knowledge that has overcome this challenge. For example, when we were to understand the growth and division of cells, we would first read about the process in textbooks and imagine the movements in the cell in our minds. However, this is not reliable because the picture we have in our mind might be completely different in reality. There is no way of explaining it in real life. The invention of the microscope allowed us to view very tiny organisms and rely less on our imagination. Even though there are problems with our perceptual systems, this doesn’t mean that knowledge gained from our senses is completely unreliable. Discuss this claim with reference to at least one Areas of Knowledge. *Try to keep this within a few paragraphs. Today in class, we discussed about Sense Perception which is categorised under Ways of Knowing. We learnt that there is no direct connection from mind to the subject, instead, it is affected by how our mind perceives and interpret. We would often fill in the unknowns in our minds through our expectations or personal experience in order to understand why something is the way it is. We would often search for meanings and patterns within these subjects. We see things highly subjective as we don’t take account of the context of the subject. We only believe things that we see true. We cannot interpret the world purely based on sight, as the way we perceive things involves the search for meanings and patterns. For example, when scientists do experiments, they tend to only focus on the observations that favour their hypothesis and completely ignore the ones that go against their hypothesis. As different people may perceive in different ways, by using only our sense perceptions to analyze information, it may lead to wrong conclusions. There may be problems with our perceptual system, that doesn’t mean that knowledge we gain is unreliable. For example, we were taught that something is blue, however in the lens of other, they might see my blue as their yellow. This is something we can never find out. But we all agree that that is the certain colour and we accept them. In terms of Art, different people have different interpretation of an art piece as how we interpret the work is influenced by how we were brought up, our past experiences and expectations. These factors all contribute to how we see it. For example, seeing the colour of blue for some people might trigger sad moments in the past experience while others might trigger calming and relaxing moments. But there really isn’t a “right” or “wrong” perception, as the reliability of this perception is dependent on the individual themselves.